Widow of rabbi gunned down in Tuesday's gruesome terror attack demands that government retroactively recognize community. 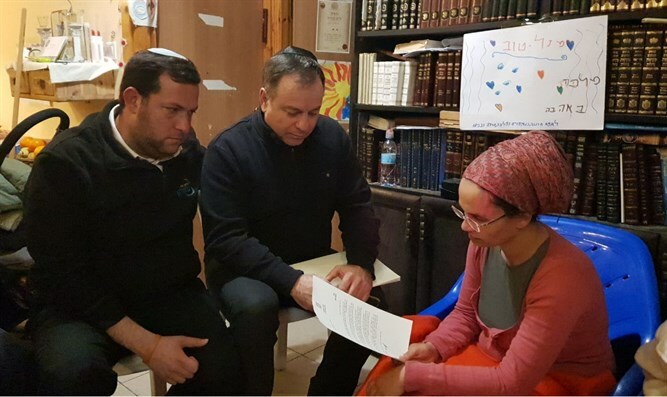 On Thursday, Prime Minister Binyamin Netanyahu ordered the Defense Ministry to connect the Havat Gilad community in Samaria to Israel’s national electricity grid immediately, days after Rabbi Raziel Shevach was gunned down by Arab terrorists just a few hundred yards away from his home. Shevach's widow Yael welcomed the move, but asked Netanyahu's Chief of Staff Yoav Horowitz why the village had to wait 15 years to be hooked up to the electrical grid. "It's embarrassing," she said. "It's a joke that someone needed to die for us to get electricity." Shevach demanded that Havat Gilad be legalized in wake of the grisly terror attack. "It's a joke that you're trying to give us electricity when there is an entire village that needs to be legalized," she said. "I want to know that in 10 years' time they will not move my husband's grave because we waited too long [to legalize it]". "I want to know that his death was not in vain," she added. Shevach's remarks were seconded by Samaria Regional Council head Yossi Dagan. "We want to get out of the [seven-day] mourning period and know that the settlement has been legalized," Dagan said. "There is no reason why this community should not be legalized - it is a village that is on the private land which is owned by the Jews who live here. "We are thankful for the decision to give electricity but that is not enough. This is the time to approve this village after 15 years. There is no reason not to," Dagan emphasized. Defense Minister Avigdor Liberman (Yisrael Beytenu) announced soon after Shevach's murder that he was exploring different options to legalize Havat Gilad. "I have instructed the heads of the Defense Ministry to assist the family and the residents of Havat Gilad. I have also ordered an examination of the possibility of legalizing Havat Gilad and making it a community among the other settlements in Judea and Samaria," said Liberman. Havat Gilad was established in 2002 in memory of Gilad Zar, security coordinator of the Shomron Regional Council, who was killed in a terror attack. Dozens of families live on the farm, but none of the homes have permits. Many of the buildings at the outpost have been demolished by the army only to be rebuilt.